Mountain biking is the most popular form of cycling. You get to ride in locations that most people will never be able to see unless they had a mountain bike. 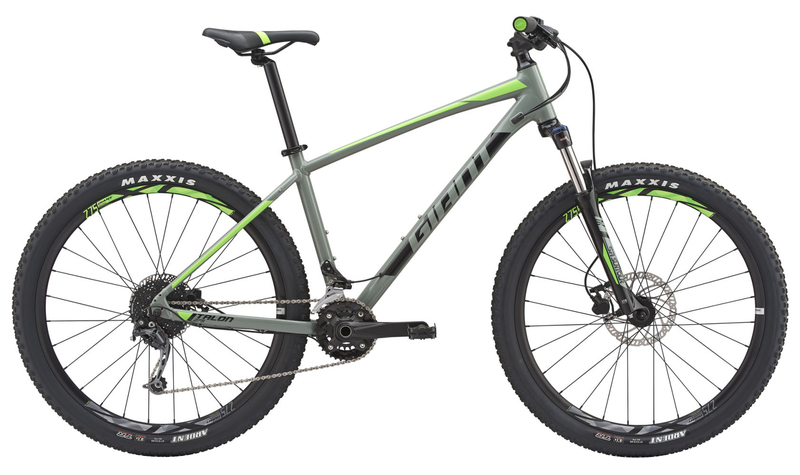 The 2019 Giant Talon 27.5" 2 Bike is a hardtail mountain bike that has an aluminum frame that is lightweight and incredibly durable. It has 100mm of travel on the fork and is built for XC adventures. The frame has internal cable routing for a clean look. The Talon 2 comes with a 2x9 Shimano drivetrain. The drivetrain consists of a Shimano Deore Shadow Plus rear derailleur, a Shimano Alivio front derailleur, and Shimano Acera M4000 shifters. The cassette has an 11-36 tooth gear range that is perfect for riding in all terrain. The Tektro HDC M275 hydraulic disc brakes provide ample stopping power needed to ride XC. The rims and Maxxis Ardent tires are both tubeless ready so you can drop the tire pressure down for a smoother ride and better traction. It features an SR Suntour XCM fork has a coil spring with a hydraulic lockout and preload adjuster. If you're looking for an XC bike to have endless fun on the trails with, then you'll love the 2019 Giant Talon 2 27.5" Bike. 165 - 173 cm 5'8" - 5'11"
173 - 180 cm 5'11" - 6'2"
180 - 188 cm 6'2" - 6'4"